Why Is Race the Line? 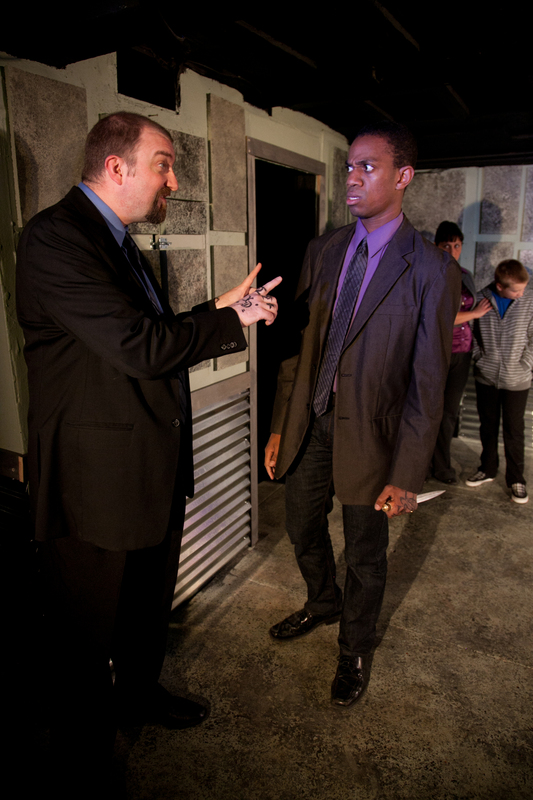 Lord Capulet (Jon Nagel) and his nephew Tybalt (Reggie D. White) in Impact’s production of Romeo and Juliet. Photo by Cheshire Isaacs. I had an interesting conversation with a theatremaker recently about casting. The discussion centered around multiethnic casting, particularly whether casting actors of different races as members of the same family would make the storytelling in the play unclear. The concern was that audience members would have trouble reading the actors as related and therefore have trouble following the play’s narrative. That’s a serious question, btw, not a facetious construction meant to elicit a WOMP WOMP from my fellow SJWs. We take it for granted that we put our disbelief in suspension when we go to the theatre, but that suspension has limits. When we see something inaccurate onstage, for example, it pulls us out of the narrative. When an actor playing a medical professional pronounces the word “larynx” as “larnyx,”or says the blood type B+ as “B plus” (both of which I’ve heard), I have trouble maintaining the belief that that person is a medical professional. In casting, however, we make enormous allowances. We take it for granted that the storytelling remains intact in a production of As You Like It although the actress playing Rosalind is married to the actress playing Celia, the actor playing Orlando is married to the costume designer, and the actor playing Charles the Wrestler has never wrestled a day in his life. We take it for granted that the storytelling remains intact in a production of Romeo and Juliet although we know Lord Capulet, Lady Capulet, Juliet, and Tybalt are not related and, in fact, look nothing alike. We lauded Peter Dinklage as Richard III although his disability is nothing like what Richard’s was, and we lauded both Sir Ian McKellen and Kevin Spacey as Richard III, although neither has any disability at all. 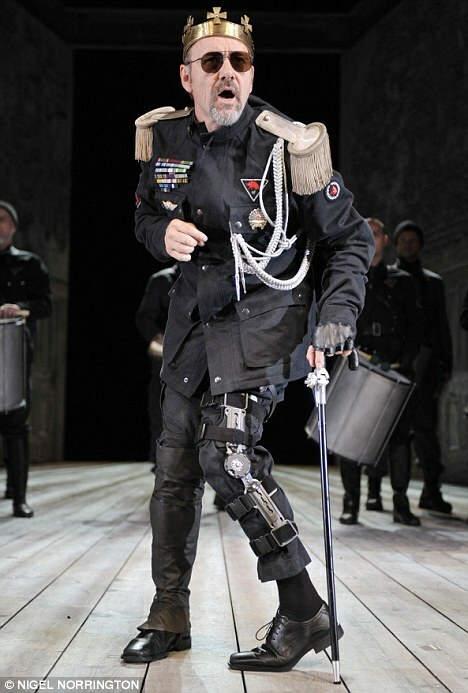 Kevin Spacey as Richard III at the Old Vic in London. Photo by Nigel Norrington. It goes even further than that. People think nothing of casting a woman as Juliet’s nurse who is far too old to have plausibly given birth 13 years prior, although her entire relationship with Juliet hangs on that fact. People think nothing of casting a woman as Juliet who is visibly more than twice Juliet’s repeatedly stated age. We rarely expect an actor playing Iago to have military bearing although his years-long military experience and current military rank are central to the character and the narrative of the play. Hell, we live in a world where a major company can hire an all-white cast to do a show as vague “Native Americans” and almost no one bats an eye apart from Native American theatremakers and a few bloggers (also this). So why is it so common for theatremakers to hesitate considering– or even refuse to consider– an actor of color to play the daughter of a white man, a Puritan farmer, the grandmother of a white woman, or a founding father (all examples taken from personal experience or discussions I’ve had with other theatremakers)? When we already are well aware that the actor isn’t the character, the characters’ relationships are (almost always) feigned, and the locations and actions are (almost always) pretend, why is that one factor– race– the line in the sand? I don’t mean to discount the importance of race in our culture, or in the lived experience of people of color. What I mean is: Why is race so often THE most important consideration in casting, even when the production is not specifically about race? Why is race considered so much more important than other factors, such as age, suitability for the role, or skillset? If you’re producing A Raisin in the Sun, M Butterfly, or Othello, the race of the characters is of primary importance, but most plays are not specifically about race. There’s no reason Tybalt cannot be Black in an otherwise all-Caucasian Capulet family. There’s no reason Eurydice cannot be Asian and her father cannot be white in Sarah Ruhl’s play. There’s no reason Joe Pitt cannot be Latino while Hannah Pitt is white in Angels. My own cousin is Black, and there are literally millions of other multiracial families in the US. Julie Eccles as Gertrude and LeRoy McClain as Hamlet in California Shakespeare Theater’s Hamlet. Photo by Kevin Berne. 1. But they WERE all white in that time and place. For one thing, are you certain? Because you’re probably wrong, even when you’re talking about Puritan Massachusetts or Colonial America. And also: So? There are lots of things we’re choosing not to depict accurately (some of which I’ve listed above), either because we have made a choice to believe they aren’t important, or because we don’t have the capability to. Think about this: 130 years ago, the difference between an Italian person and a white person would have been apparent to any American. To cast an obviously Italian woman as Juliet would have appeared absurd to an American audience in 1885, even though Juliet IS Italian, due to the enormous racial prejudice against Italian immigrants at the time. 2. Well, how about white people playing Black characters? Huh? Why can’t THAT happen? HUH? REVERSE RACISM. Well, it actually DOES happen, especially in Hollywood. Google “whitewashing.” I’ve already covered why this is problematic in this very space a bunch of times. Here, read this. Don’t believe me? Check out Racebending. 3. It will make the narrative hard to follow. This is the argument that arguably has the most (any) merit. A friend of mine has a daughter who looks exactly like her in every way but skin color, and did so even as a toddler. Although they looked so much alike, she was constantly asked, “Where did you get her?” I told my friend she should reply, “Out of my uterus.” People often unthinkingly assume all familial relationships are biological, and then use racial similarity as a marker for familial relationship, even though they know, if they pause to consider, that adoption, stepchildren, and biracial people exist. Stories like these underlie that. However, we can’t necessarily apply that to theatre. We don’t know the relationships of any of the characters onstage until they are revealed to us, and we already know we’re in the world of pretend. If you tell an audience that, for example, two men of different races are brothers, almost everyone in the audience will accept that. It’s not uncommon, especially in indie theatre and in areas with diverse populations, to see diverse families onstage. Yet some theatremakers still hesitate to cast people of color for reasons of narrative clarity, yet will discount literally every other physical marker as unimportant. 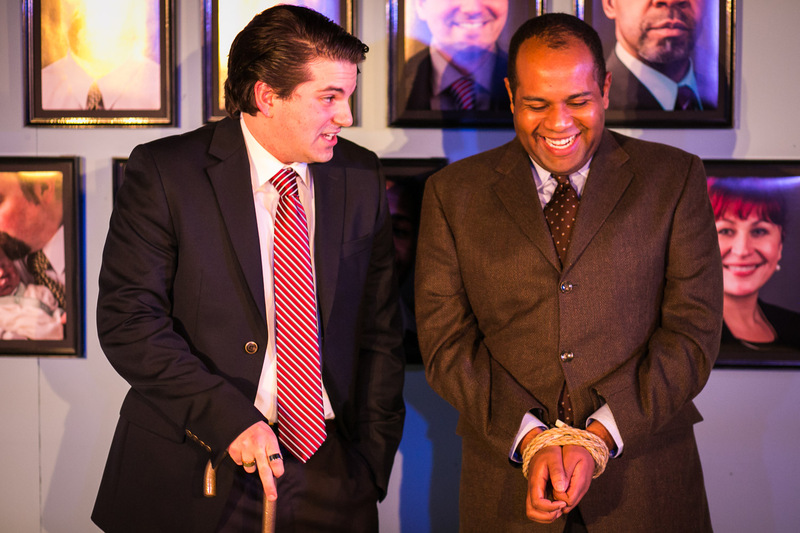 Sean Mirkovich as Richard, Duke of Gloucester, and Kelvyn Mitchell as his brother, George, Duke of Clarence, in Impact Theatre’s Richard III. Photo by Cheshire Isaacs. I think what’s going on here is simple. We see “white” as “normal,” the baseline: neutral. We see people of color as a deviation from that– particular, different, “other.” Race has narrative, of course, and we must consider that narrative while casting. If you have an all-white cast apart from one Black actor who’s playing the bad guy, you’re saying something specific. But often diversity in a play that’s not about race doesn’t change the narrative at all. 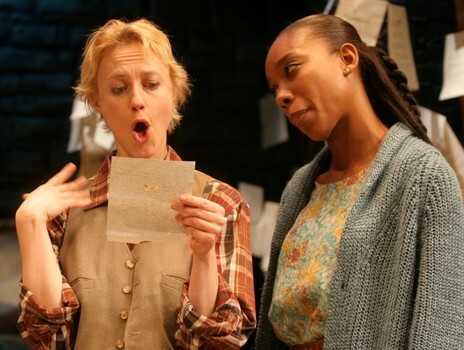 How much difference would it make to the narrative of As You Like It if cousins Rosalind and Celia were of different races? Sarah Dandridge as Rosalind and Francesca Choy-Kee as Celia in the Cincinnati Playhouse in the Park’s production of As You Like It. Photo by Sandy Underwood. But because we see whiteness as “neutral,” when we look at white actors, we imagine a palette of possibilities, a narrative polyvalence, that we do not afford to people of color. A white person can be anything; a person of color is primarily and foremost “of color,” and therefore is relegated in most cases to inhabiting spaces already designated as such. A white person is read as “person”; a Black person is read as “Black person.” There are casting directors who still separate their files into “ingenue,” “leading man,” “Asian,” “Black.” White people are divided into types; people of color are their race alone. Thankfully, this is becoming less and less common, but we’re still far behind full inclusion of people of color. However, even small gains by people of color in casting are seen as a threat to white actors. We have a long way to go. Years ago I made a personal commitment to include people of color in lists of actors I was recommending for roles wherein race wasn’t specified. Whether that had any impact on the eventual casting of the role or not, it was one way I felt like I could personally challenge the idea of whiteness as neutral in my day-to-day life. I get these all the time– people ask me for recommendations for roles like “woman, 20s, good comic timing, excellent physicality” or “man, 30s, sophisticated, witty, elegant.” All too often the implication is that a role is white if not otherwise specified, and I refuse to accept that. We’re getting better at diverse casting, certainly, but we’re still struggling with it, particularly on larger stages, where some directors can be enormously resistant. While we take it for granted that an audience can see past a 30-year-old woman playing a 13-year-old girl (“come Lammas-eve at night shall she be fourteen”), or a 70-year old woman playing that 13-year-old girl’s wet nurse; while we take it for granted that people will accept Kevin Spacey as disabled; we all too often refuse to take it for granted that an audience will accept a diverse family or a Black Puritan. It’s time to rethink this. We need to slow down and recognize when we’re positing whiteness as neutral and color as a deviation from that, and we need to stop imagining that the only places audiences can tolerate actors of color are in spaces clearly designated for them. We need those ethnic-specific roles (and plays), certainly, but we also need to open our minds to making our onstage families look more like our offstage families; to giving our audiences credit for being willing and able to play pretend with us wherever we take them; and to giving actors of color consideration for their types, talents, and abilities apart from– and in addition to– their ethnicities. 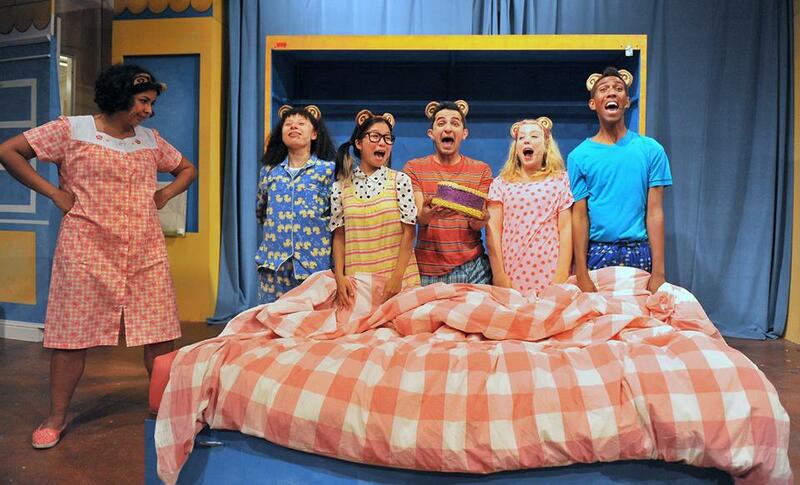 Bay Area Children’s Theatre’s production of Five Little Monkeys. Mama Monkey and her five little monkeys as one happy (and busy!) family. Photo by Joshua Posamentier. I agree. we really should be beyond the color or background of a person. We should see beyond to the talent and what assets that person brings to the production or whatever. Such as the current fight politically. Congress should be beyond their current obstinance where the President is concerned. “Race” should not be an issue. Because it is says a lot about our society and its stupid need to categorize. Not beyond color or background, but able to see color and background the same way we see age or gender: as a fact about someone that we discern and accept. Being a white woman married to an African-American man has made me both more accepting and more critical of this practice. But my criticisms are really specific. For example, I saw a production of Winters Tale where Polixenes was played by a dark complected African-American man, and Hermione was played by a blonde, fair skinned white woman. But the child was played by a marrionette that was obviously white, and Leontes was played by a white after. So when it came to Leontes’ suspicions that the child wasn’t his, I simply couldn’t suspend my disbelief. But if race isn’t integral to the plot, I’m fine with it. This is Dana Lau 🙂 Thank you so much for writing this. I have always been obsessed with racial identity and because of where I grew up (First generation Chinese American in Iowa) it was hard to be straddling 2 different worlds without anyone being able to my predicament, or rather, being able to appreciate my predicament. Now, that I have been auditioned many many times and have been rejected many many different times– sometimes on the merit of my “race,” I know that things need to change and I hope that I am helping change them. I think you have echoed Shonda Rhimes …that it’s not about diversity but the “normalizing” of what people see in their own homes and in the world. Thank you for writing this, so much. This is so important to be thinking about, and doing about. The one thing that comes to mind about race in casting is the fact that race *does* continue to be a huge factor in the lived experiences of people of color in this world of systemic racism, and so all too often, I think that directors think: if I cast a person of color in this part, I am then Saying Something About Race. And to a certain extent, yes, that often is happening, because it is, as you note, very difficult for people *not* to see race as a primary identifier, fraught with its own meaning. It is therefore hard for people not to see the casting of people of color in certain roles as being about race rather than about who is the most capable actor. I think that directors think: if I cast a person of color in this part, I am then Saying Something About Race. What some directors forget, if they cast a white person in a part, they are also Saying Something About Race then, as well. This is so good. Thank you. I am involved in a long discussion of this very issue on FB. Is there anyway I can post this? You can copy and paste the link into the comment field, or you can click the facebook button below the article. Thanks! Thanks – this makes me nuts, that people aren’t aware that there were people of every color and creed in Puritan America (including free Black, Jewish, and Muslim farmers and tradespeople). My only correction – always left out are disabled actors. Brilliant, talented, skilled actors with a variety of disabilities. In every age, in every family, in every country, easily a part of the mix. And hopefully eventually women of age, size and character rather than all young, beautiful and skinny (other than Juliet’s Nurse, who – as you mention – is always played too old). As a person with a disability myself, disabled actors are always on my mind. I think our perception of disability is quite different than our perception of race. They share some similarities, but are quite different. Since this piece was specifically about the way we perceive race onstage, I didn’t include disability but I have included it elsewhere in the blog. One of my main issues about the complexity of the issue is that there’s no discrete “disabled actor.” It’s not a useful category since we’re all disabled in our own ways. A deaf actor is not interchangeable with an actor who uses a walker. In some cases, that doesn’t matter at all for casting, and in some cases, it matters enormously. There are people who get angry about disabled characters being played by actors without disabilities, but finding an actor with the same disability as the character who is right for that character in every other way (age, type, skillset, union status, schedule availability), particularly for the majority of companies who must cast within their local market, is approaching zero. I think larger companies with the recources to do national searches should make the effort– we should all make the effort, of course– but the pool of disabled actors is tiny. What I would like to see are more actors with disabilities included in roles not written specifically for them. As we begin to cast disabled actors more often, the available pool will also increase. Right now, finding actors of size, trans* actors, or actors with disabilities is wickedly difficult because they are discouraged at a very young age. They never see themselves onstage and they are told flat out that no one will cast them, so they either turn to another aspect of theatre or leave it. I’d love to see that change, but it requires high-profile theatres, high profile university theatre departments, and, to a certain extent, film and TV to be on board to really push that change culturally. I love this! As the mother of an African American aspiring stage actress, this is a conversation we have all the time about why no one considers that an role can be anything other than white when casting. There are just so many roles where that doesn’t matter! And as bad as African American actors say they have it, I think of the Asians, Middle Eastern and Latino actors who seem to be largely left out. Again, great read.